Let's face it. Collecting magic posters is not a hobby for the poor. Actually, the poor probably don't have time for hobbies. But that's beside the point. The point is that magic poster collecting, to say nothing of poster collecting in general, is a pricey endeavor. Some of the first items to find their way into my poster collection were a pair of window cards. The images are now familiar to nearly every collector of magic, be their specialty is books, apparatus or tokens. My first two window cards advertised appearances of Charles Carter, known to the public as "Carter the Great." The cards, of course, are today commonly known as "Carter Beats the Devil" and "Carter the World's Weird Wonderful Wizard." Full-color lithos printed on heavy paper (card) stock, these store window advertising pieces are more durable than posters, of convenient size to display and most importantly, to me anyway, affordable. Just as important as their price, though, is the fact that magician's window cards aren't any less appealing from a graphic standpoint than the full-color lithos of Carter and his contemporaries. And even though the prices of my Carter window cards has risen since I acquired them six or seven years ago, the same images are still readily available. And just as eye-catching as they were after coming off the presses at the Otis Lithograph Company of Cleveland, Ohio in the 1920's. Despite the increased prices, both Carter window cards are still much more modestly priced than a full-blown poster. You could call them "junior" posters. Every magician of the now "golden age" of the art seems to have used these "junior" posters to advertise their in-person appearances. The Otis Lithography company produced similarly sized full-color cards for other magicians of Carter's era. Two in my collection advertise Howard Thurston's show. One is the classic "Imps Portrait," and the other, probably the most common Thurston Otis window card, is the "She Floats" image, which depicts several poses Thurston struck during his performance of the levitation. Whereas a Thurston "Imps Portrait" one sheet poster is unquestionably going to carry a hefty price tag, the window card, which is the same image, costs substantially less and is easier to find room for on the wall. The "She Floats" card was also produced as a one-sheet poster, and again, the window card is more modestly priced than the poster. The Thurston cards in my collection, however, tend to be on the more expensive end of the window card scale. Though I have well over 100 cards, nearly all of them cost less than $100. And not because I turned them up in unlikely places like flea markets and antique shops. Most were purchased from magicians, collectors and magic dealers. Some spectacular examples, like the Mercedes card shown here, are as visually appealing as any other "big time" poster, yet cost much less. To me, though, an item's price is not its only appeal. Many window card images have yet to be published in widely circulated journals or books. Collectors (like me) looking for something previously unseen by fellow magic history enthusiasts may have a new angle to explore in window card collecting. 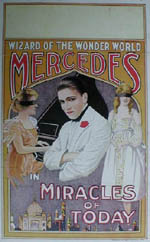 Mercedes, incidentally, was a mentalist whose act had a musical theme. Audience members would think of songs, which would be played by a medium (as pictured) seated at a grand piano. Mercedes circulated among the crowd, pumping the spectators for information. For those collectors interested in adding posters of as many different magicians as possible to their hordes, window cards may also offer a solution. 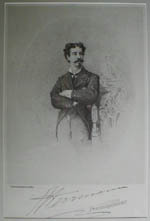 Take, for example, the cards produced by W.W. Durbin. The IBM's second president, Durbin, in addition to being a politician (and Secretary of the Treasury under Franklin D. Roosevelt), owned a sign printing company in his hometown of Kenton, Ohio. When organizing the first few IBM conventions in the mid-1920's, Durbin knew that the organization could not afford to pay the performers. Instead, in trade for their services, Durbin's sign company printed window cards for the magicians appearing on the convention program. 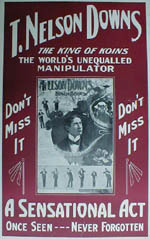 The window cards, in addition to advertising the convention's public shows to the people of Kenton, could be used by the performers to advertise professional engagements throughout the year. Though they are not stone lithographs, or even full color images, these window cards are, for collectors like me, an affordable way to lay one's hands on advertising material of "big name" performers that might otherwise be out of reach. T. Nelson Downs is once such big name that Durbin printed window cards for, a magician whose posters are nearly impossible to come by. Though it may be a long time before I'm able to comfortably afford the classic Downs "Portrait" one sheet, the window card pictured here was not only easier to find and less harmful to my pocketbook. The same can be said for the Cardini window cards printed by Durbin. Cardini posters are non-existent. Aside from broadsides and day bills, that is. To my knowledge, the Cardini window card printed by Durbin is the only readily available poster of the famous English manipulator that is also pictorial. Axel Hellstrom was another featured performer at an early IBM convention organized during Durbin's term as the organization's president. Hellstrom's window cards from this appearance are appealing not only to collectors interested in owning one copy of each card printed by Durbin, but also to Thurston collectors. 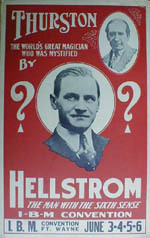 Hellstrom, who's act was akin to hypnotism (though called "Hellstromism") was billed as "The man who Mystified Thurston." A portrait of Thurston appears in the upper right corner of the Hellstrom card issued by Durbin's sign company. Durbin's cards also provide a window into the lives of some of the lesser-known lights of magic. Al Saal, for example, was said to rival Cardini in manipulative skill. Based in Toledo, Ohio, his act consisted mostly of cigarette manipulation. His advertising hailed Saal as "The Man with the Lights," a direct reference to his superlative cigarette manipulation act. Saal's successes were not nearly as great as the monocled Brit, however. Today, his name has been all but forgotten, even by magic collectors. Saal spent most of his life working as a 40-miler out of Toledo. He was, however on the bill at several early IBM conventions along with Cardini and performers like Max Holden, Roberta the 12-Year-Old Marvel and Jack Gwynne. All of them had window cards printed up by Durbin, Saal included. Of the 20 or so Durbin cards in my collection, half can be identified as having been specifically used to advertise IBM convention shows. These IBM-specific window cards were posted with what I'll call "caps," placed on them. These "caps" printed pieces of paper folded so as to cap the upper right corner of the poster. The printing on these "caps" told readers where and when the act was appearing. The printing on the "caps" was done in red and black, and all the examples in my collection are for IBM convention appearances. Other cards printed by Durbin included blank space at either the top or bottom of the card over which could be printed the location and date of a specific performance. This blank space is a common feature of window cards of all varieties. Though my collection of the Durbin-produced window cards is not yet complete, it is close. There are well over 25 in the set. A complete set is on display at the American Museum of Magic in Marshall, Michigan. It makes for an imposing display. Other, more colorful and artistic window cards used by lesser-known magicians are also available at modest sums. Personal favorites include those used by Lyceum and Chautauqua magicians like Germain, Laurant, C.A. George Newmann and Ed Reno. In rural America, Lyceum and Chautauqua reigned as popular forms of entertainment near the turn of the century. Teddy Roosevelt said of Chautauqua that it was "The most American thing in America." Lyceum shows were meant to fill time during the winter months, taking place in auditoriums or gymnasiums. Chautauqua predominated the summer and toured from one town to the next, each show being presented under enormous brown canvas tents. 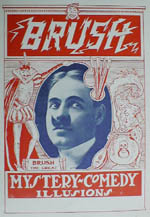 Edwin Brush has been cited as the first magician to play a Chautauqua circuit. Though Brush did have full-color lithographs created by Goes and other houses to advertise his appearances, some beautiful advertising was produced on a smaller scale for him, too. Often times his window cards combined both photographs with artwork. Whereas a Brush half-sheet typically sells for $1500, his less elaborate window cards usually cost less than $75. The first Brush card in this article is one of a set of four executed by the same printer. His signature upturned mustache, evening dress, white tie and the overall mystical feel of Brush's advertising is just as evident in his less expensive publicity material as in his (now) more expensive lithographed posters. There seems to be a subtle theme running through the artwork Brush used. As with the first card, Brush's ever-present mustache is included in the second image shown here. This card is part of another series that drew on original artwork and photographs to create enticing advertising material. 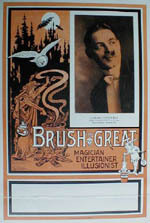 Fantastical images appear to have been Brush's advertising hallmark - be it a window card or poster announcing his performances. Eugene Laurant, billed as "The Man of Many Mysteries," also toured Chautauqua circuits for many years. 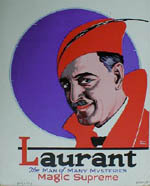 In fact, in the heyday of Chautauqua, Laurant was one of the Redpath Chautauqua Bureau's highest paid entertainers. Laurant's weekly salary is said to have topped that of William Jennings Bryan, the famous statesman and orator. Bryan also made lengthy and regular Chautauqua tours as a feature speaker. The Laurant card shown here is interesting for several reasons. In addition to being printed by Redpath, the giant of giants in the Chautauqua industry, magicians will be interested to know that the card was designed by Harlan Tarbell, author of the famous "Tarbell Course in Magic." Tarbell created window cards for several other magicians, as well, not to mention throw out cards and promotional brochures. Many were for Chautauqua performers like Laurant and Brush. Examples of Tarbell artwork can be seen in the final lesson of the original mail order version of the "Tarbell Course" (Lesson 60). Other Chautauqua agencies produced less aesthetically appealing, though certainly interesting window cards for their contract magicians. This panel-like window card for Dana Walden is one such example. Walden's name, Like Saal's, is one not often circulated today, even among students of magic history. After acquiring this card, however, I started seeing Walden's name pop up in magic magazines from the teens and 20's. Further digging revealed that in addition to magic, he presented "25 Heads Under a Hat Brim" (Chapeaugraphy) as part of his evening-long entertainment. Walden featured a rendition of the Egg Bag in his shows, and was a frequent caller at Thayer's shop in Los Angeles. Reports of his show I have come across have been nothing but laudatory. Window cards like this one may be the only opportunity a collector may have to own a piece of ephemera of certain "tall grass" showmen and lead to discoveries about their careers. Harry Blackstone, Sr. was anything but a "tall grass" showman, even though he was a small town boy at heart. Many considered his illusion show the finest to ever play the American stage. Luckily, Blackstone window cards are not difficult to find. While the "Super Magician" did not spend as much money at the printer as far as artwork was concerned, tracking down one of his scarce lithos is tough even if you have cash available to make the purchase. In sheer volume of printing, however, Blackstone probably equaled his contemporaries. The fact that his career didn't officially end until 1955 likely has something do with the availability of his window cards, too. 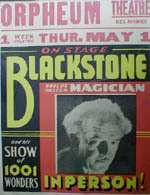 Though they are not lithographs, Blackstone cards do convey a certain image of magic and the magician necessary to draw patrons to a theater - they sounded the horn of the magic show fervently enough to sell tickets. Many, like the Brush cards mentioned earlier, combine photographs effectively with text and illustrations. The example accompanying this article is an oversized card from the 1940's. Notice the overprinting on the top of the card. At the Egyptian Hall sale and auction in September, 2000, a veritable raft of Blackstone paper was available for purchase. His window cards generally ranged in price from $100 to $300 at that time. Of course, not all window cards fall in the "bargain" category. Thurston cards printed by Strobridge, not to mention Kellar window cards, will never be inexpensive. Some collectors may also be familiar with the "standees" made by Strobridge for Thurston. These images are exactly like the "Imp Portrait" posters he used throughout his career, except that they consisted simply of a cutout of the portrait portion of the poster. Printed on heavy board, they were meant to stand in windows or on counter tops. Blackstone had similar standees made based on a portrait litho printed by Goes in the 1920's. These, too, carry hefty price tags.Even Alexander Herrmann saw the sense of store window advertising. Though not many Herrmann posters survive today, even fewer window cards advertising his show are known to exist. The one accompanying this article, however, is just that - a 14 x 22" window card with little more to it visually than the magician's picture and signature. Much like the famed "Houdini for President," all Herrmann needed to advertise his appearance was his name and his image. His reputation took care of the rest.Not all performers were so lucky. As with the other advertising efforts, window cards were distributed in droves to lure in the masses. And just like their relatives the lithographed one sheets, half sheets and three sheets, window cards of bygone eras aren't any more available now than they were 50 years ago. Once a storeowner thought the card had served its purpose, it most likely was disposed of. Though they might not bring the same results at auction as the pretty, eight-color, full-sized work of Strobridge or Friedlander, that doesn't make them any less significant. Window cards must've caused as many patrons to wander though the doors of a theater and into a world of magical fantasy as their brethren posters did. For collectors, a window card, as much as a poster, can have the same effect: Taking them back in time to an era of lavish, awe-inspiring magic shows where men of mystery roamed the earth and waxed moustaches reigned supreme. Gabe Fajuri works in magic full time, as Project Manager for FUN Incorporated, one of the world's largest manufacturers and distributors of magic tricks and novelties. Fajuri is also a contributing editor to MAGIC Magazine. He would like to hear your feedback about this article. Write him at gfajuri@ameritech.net.